America based world telecommunications major Motorola has started showcasing its Xoom tablet which will feature the Google Android 3.0 Honeycomb. 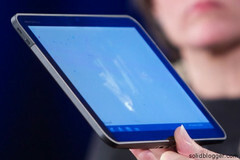 The 10-inch Motorola Xoom is packed with a 1280 x 800 pixel HD display and includes 1GB of RAM. Processing capabilities for the tablet are powered by a 1GHz NVIDIA Tegra 2 dual core CPU. The gadget is said to posses integrated 3G and WiFi, however there is the flexibility and possibility of an upgrade to 4G, but this will be possible only when 4G components and network are ready. Thus a 4G upgrade will come through only by the second quarter of this year. The dual core is capable of playing 1080p HD video and can record 720p HD video. The company also promises up to 10 hours of battery life while watching movies, and not only that, tasks which are comparatively less burdensome on the processor will lead to an even better battery life. Among such tasks would include surfing the web which is not that much of a tedious and heavy duty task. The Honeycomb also includes a Web browser that is very close in functionality to the Google Chrome web browser. The tablet can be purchased from Verizon in the first quarter of 2011.